Onkyo CS-545UK review | What Hi-Fi? 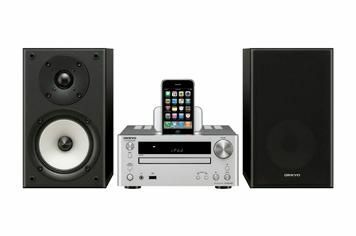 The Onkyo CR-545UKD receiver is compact, and has its iPod dock under a flap in the lid, which also acts as a support for the player. It's one of the least expensive systems of this type, and one of the simplest, too. There's a composite video output to feed menus to a TV, but the scrolling display on the receiver is clear and easily read at distance. What the Onkyo lacks in extra inputs – it has a USB for memory sticks, and just one set of analogue line-ins – it makes up for in the simplicity of its front-panel layout.There are minimal play/skip controls, volume, input and tone adjustments. And that's it, give or take a headphone socket and a subwoofer output, plus a remote control that's compact, but not terribly intuitive even after considerable use. You'll notice that we've been talking a lot about the main unit, but not about the speakers. That does the Onkyo D-045s something of an injustice: in a sector of the market where perhaps the best thing to be said about most standard-equipment speakers is ‘can I just buy the receiver unit? ', the Onkyos aren't at all bad, as you might expect from a company used by many other brands as a speaker supplier. You can buy the receiver without the speakers – and that'll save you £100 – but while partnering it with popular budget boxes can give a sound with more life, the amplification can struggle a bit at higher levels – hardly surprising given that it's rated at 40W at 4ohms/1kHz/10% distortion. There's a definite sense that the system and speakers have been built to work together, and that's just what they do. The Onkyo isn't going to trouble the most expensive systems around, and the Denon D-M38DAB has just got it edged when it comes to ultimate sound quality, but the sound here is honest, has bags of life and drive (provided you turn off the cloying Super Bass feature) and even creates a more than convincing soundstage. Playing everything from classical chamber music on CD to rock and pop from an iPod, this is an enjoyable, involving listen, if lacking the slam and weight available eleswhere. Despite that dock, others make more of the Apple players..
We keep coming back to that word ‘honest', because it's the best way to describe this system. It keeps things simple, and is all the better for it.